Do you fancy running and raising funds for PTSD Resolution on the 10th September 2017? 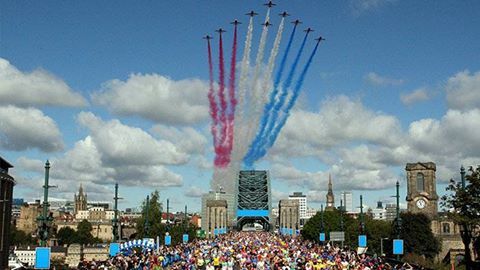 The Great North Run is the biggest half marathon in the UK and the World with over 57000 runners taking part in the famous 13.1 mile run, where participants run between Newcastle upon Tyne and South Shields. The race was devised by former Olympic 10,000 metre bronze medallist and BBC Sport commentator Brendan Foster. PTSD Resolution is a charity helping veterans, territorial army and reservists who are struggling to settle back into a normal work and family life because of military trauma suffered during service in the armed forces. So why not set yourself a 2017 challenge and run for us, while raising money for a worthwhile cause. Please set up a free charity page on our Just Giving site – visit the page and click on "Fundraise for Us" at https://www.justgiving.com/ptsdresolution/ - funds go directly into the charity's account. A PTSD Resolution t-shirt will be provided for all runners.